Matter has a ghoulish and delightful dark candle which I very much like to add to my infantile bed room deco. Alas! 95 dollars is way above my wallet weight to haunt my wife. 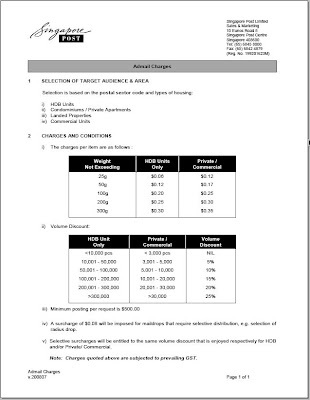 Spotted in one local forum, this order form is for advertiser to pay Singpost for their flyer, brochure, ads mail etc to be delivered to HDB mailbox by postman. Click to enlarge. Hey Singpost, dun liketat leh! HDB cleaner has had hard time sweeping up area around the mailbox. Can you also design another form for us to pay you so that those junk will not come to our mailbox? My wife keeps complaining about this. "My paper suggests a way that the parent's psychology before conception can actually affect the child's genes." "Although happiness is subject to a wide range of external influences, we have found that there is a heritable component of happiness which can be entirely explained by genetic architecture of personality,"
So now they mean leaving my children with obscene sum of money and power to dictate a multitude, like being the king of some nation, will not make them happy? Over at NASA observatory, a team of scientist set out to predict what the ozone layer would have looked like today and in the future if countries around the world had not signed the Montreal Protocol Treaty banning ozone-depleting chemicals. As you can see here, by 2060 the Ozone will be gone if Chlorofluorocarbons was not banned.